The average job search is a peculiar paradox. There may be 2,278 available positions for your chosen field, but as you scroll through pages and pages of listings, you’re lucky if two stand out. Perhaps you’re a recent college graduate searching for the needle in the haystack of three- to five-year experience jobs. Just as frustrating, you could be a senior employee wondering if any position out there matches your unique mix of skills. Either way, it doesn’t take long before you start to feel like the Goldilocks of job searching. Blanketing hundreds of postings with the same resume. Strategically focusing on a dream list of companies. But for the sake of full transparency, the former option was fueled by the motivation to get off of my parents’ couch as quickly as possible. If you’ve read any amount of job search advice on the internet, you probably know which of these two methods yielded the best results. However, there are plenty of other factors beyond your resume-sending habits that go into finding the perfect position and ensuring you get the call back. Below, I’ve gathered some of the top tips to score a job without all the added stress that comes along with the search. 1) Customize your web presence. It should go without saying, but if you aren’t customizing your resume, cover letter, and portfolio for the specific job you’re applying to, you probably won’t get the interviews you’re hoping for. While a full resume checklist warrants a blog post of its own, one tip I will highlight is taking the time to match the wording of your resume and cover letter to the position you’re applying to. In the world of marketing, jargon abounds. Whether it’s content management or landing page optimization, talk about your skills in a way that a first-round recruiter — or even a computer — will understand. Scan the job description for technical terms you can repeat in your own writing. This doesn’t mean mentioning “high-impact experiments” if you’ve never actually tested content distribution or format. But it would be wise to replace “designs hero images” on your resume with “creates multimedia assets” to make the connection clear for a recruiter. Identify themes between the resonsibilities and qualifications. If the job description repeats a desired quality, you can assume it’s a pet rock of the team. For example, the posting stresses the importance of experimentation. Therefore, you should replace or refine the anecdotes of your cover letter to highlight this quality. Take notice of culture clues. Sentiments of collaboration and teamwork appear multiple times in this job posting. As you aim to show you have this quality, refer to the company’s culture code to inform your language choice. Beyond tweaking your resume and cover letter for the specific company and role, make sure all instances of your name on the internet — including your LinkedIn profile, Twitter, Instagram, published clips, and portfolio — tell a cohesive story. Remember, every aspect of your online presence should scream, “I’m perfect for this job!” before you pick up the phone for your first screening call. 2) Don’t limit yourself to formal applications. Even if that saying is true, I would now push back on my former self with a little tough love: If you don’t know the right people, make the connections. No matter what what stage of your career you’re in, it won’t hurt to reach out to friends, alumni, and former colleagues. Even if you don’t know the right person, they might. And that referral can make all the difference. While employee referrals make up only 7% of applications, Jobvite estimates they account for 40% of all hires. You’ll notice that besides attaching my resume, I’ve shorted my recent experience to a few quick bullet points in the body of the message to make it as easy as possible to scan. I’ve also included ideal job titles and companies, while of course, thanking them graciously for their support. As frightening as it may be, emailing second connections or companies of interest without job listings is not out of the question … as long as you do it in the right way. 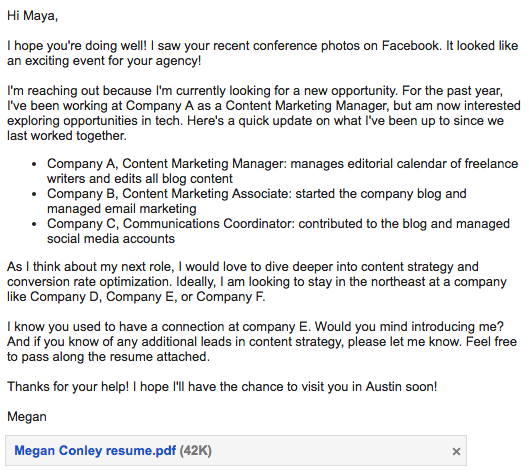 There’s a big difference between a cold email and a genuine, personalized message. Many of my best leads came out of direct messages to content directors, admiring a specific aspect of their work and asking for their creative expertise over a cup of coffee. For those who know me be best, they’ll confirm it’s completely out of my introverted, Midwestern-nice comfort zone to ever do this. But in the end, your momentary discomfort could pay off tremendously. 3) Reflect on your why. Most interview questions never change. Why are you interested in this position? What are your top strengths and weaknesses? Where do you see yourself in five years? Yet, no matter how many interviews you’ve had, it’s still easy to stumble through these questions. According to Charles Duhigg, building mental models and telling yourself stories of potential situations can help control how you think. What could be more helpful in an interview than being able to control your racing mind? Too often, we wait until the night before an interview (or even the 30 minutes before) to reflect on why we want that particular position and how we’ll answer the questions we know are coming. Instead, move this process to the top of your job search to-do list. 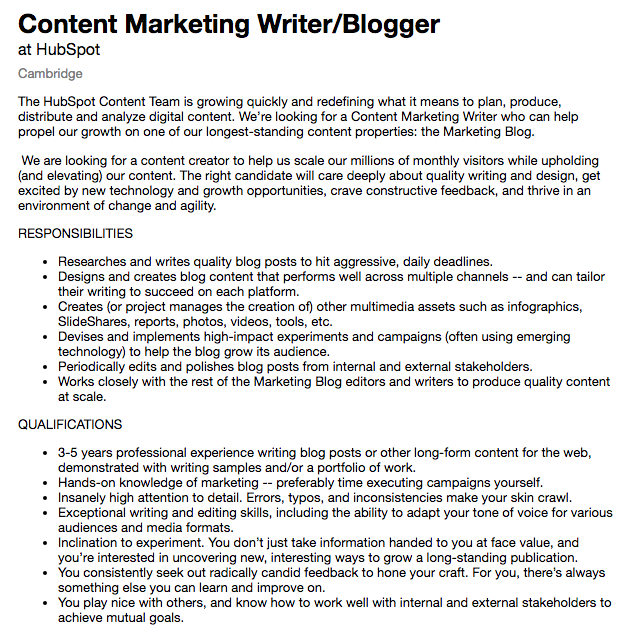 Don’t settle with just knowing you want a position as a content marketer or project manager. Consider the “why” and write it out. From my experience, the more I wrote out my reflections to common interview questions, the more confident I felt in each of my interviews. 4) Be specific in your search. At this point, you’ve compiled a list of dream companies and scoured their individual careers pages. Likely, you’ll still want to spend some time on job boards to complete your search. If you’re anything like me, clicking through pages upon pages of job links is not your ideal pastime. In the best interest of your sanity, prioritize your searching on niche job sites. If a company has taken the time (and often, money) to post a position on a niche site as opposed to simply Indeed.com, they are serious about finding the perfect fit. From my experience, companies that prioritize the interview experience also value things like career development, people operations, company culture, and management training later on. Not sure where to start? Sales Gravy is great for sales jobs, while JournalismJobs.com and Mediabistro are perfect for writers. 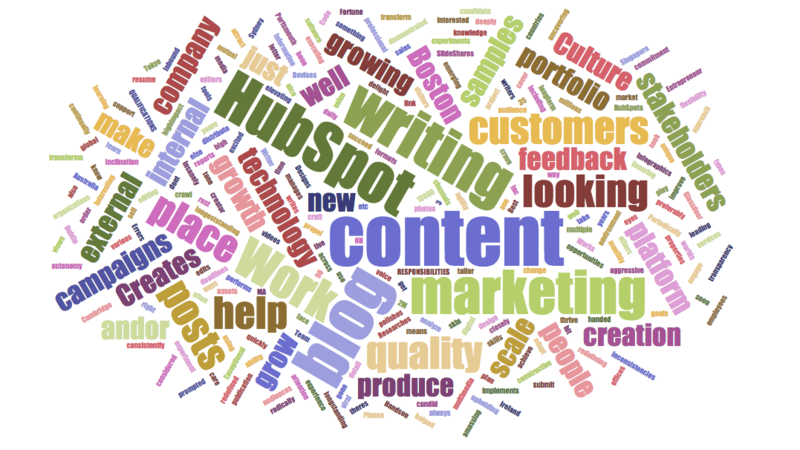 Be sure to check out Inbound.org for marketing positions. To stay on top of new listings, most job boards allow you to set up instant alerts that’ll immediately email you when a position is posted with specific keywords in your chosen area. Twitter is another option for monitoring job listings in real time. Get yourself in the habit of searching for specific keywords like “marketing job Boston” or “content director.” As you find specific companies or job sites tweeting about positions regularly, you can add them to a public or private Twitter List to make monitoring easier. Of course, don’t forget to clean up your profile with a nice headshot, creative bio, and link to your porfolio — that way, when you find the perfect job listing tweet you’re ready to start the conversation. Not so fast. When you find the listing for your dream job, here’s might advice: don’t apply for it. At least not until you think about your timing. According to a study by Bright.com, applicants that apply on a Monday are most likely to advance in the hiring process. In fact, nearly one in three job seekers who applied on a Monday moved forward successfully in the hiring process. Sound like a myth? Considering a separate study by SmartRecruiters found that most applications are submitted on a Tuesday, there could be some truth to the early bird gets the worm philosophy for job searching. The data shows that 18.5% of candidates apply on Tuesday, with 21.5% of hiring decisions also being made on a Tuesday. Therefore, use the weekend to get your cover letter and resume in line. Then, be ready to submit your application before the emails flood the recruiter’s inbox on Tuesday afternoon. While it’s nearly impossible to know the average number of applications an individual job seeker fills out before they get an offer, we do know that, on average, 118 people apply for any given job. There’s a lot of factors that affect how long your search will last: your experience level, your network, the time of year, the demand for your skill set in your geographic area. No matter what, you’ll probably fill out more applications than you can remember. Therefore, it’s absolutely crucial that you stay organized. Keep an organized spreadsheet with more information than you think you’ll need. There are some obvious inclusions, such as the title of the position, the location, the type of company, etc. But don’t forget to include the date you applied, who you included as your references, and the name and email of the hiring manager. That way, when your former boss reaches out to you because of a reference, you’ll know exactly how many times you gave out their contact information. Good news here: We have a job application tracking template ready for you to use as a part of our Interview Kit for Job Seekers. As you proceed through the job search process, use this Google Sheet to keep track of where you are in the interview process with each company and manage all of those new names like a pro (Believe me: I’ve messed up someone’s name in a job interview. It’s not fun). 7) Go the extra mile. What if I told you that your resume doesn’t matter? You’d probably question me to some degree. Of course, your resume serves the very important purpose of telling a hiring manager where you’ve been and what you’ve done. However, when it comes to making a impression, there is something much more important than a list of bullet points: proof. Show, don’t tell. It’s nothing new. In his recent Medium article, writer Raghav Haran spoke of the importance of this through the concept of a “pre-interview project.” And not nearly as many people are taking advantage of this opportunity as they should. The idea is to show your potential employer that you can do the job before you get the job, and often before you even talk to a hiring manager. For a salesperson, that might be reaching out to prospects and introducing them to the team. For a marketer, you could replace the traditional cover letter with a sample campaign, complete with an ebook, social images, and promotional blog post. The trick is, do the project before they ask. Especially for creative jobs, it’s normal for hiring managers to ask final-round applicants to write a blog post or draft a creative brief. But to really stand out, show that you are proactive about solving problems. There is a behavioral pattern I seem to follow whenever I’m applying for jobs. 90% of the time, I’m my usual conscientious, rational self. I thoughtfully sort through job listings, take breaks, consider my cover letters word-by-word. The other 10% of the time, I’m a chaotic mess. Suddenly it hits me how much I need a job and how much I need one right now. In a frenzy of panic, I binge apply. In a single night, I’ll power through 30+ typo-ridden applications until I’m too tired to function. From someone who’s fallen prey to this lie more times than I’d like to admit, don’t panic. If you’re truly being thoughtful about which positions you are applying for, there’s a limit to how many you can apply to in a single day, or even a week. Instead, take your time and form a strategy for each company on your dream list. The irony of obsessing over the job application process is you’ll bring yourself to burnout before you even start training for your new position. Don’t treat applying for jobs like it’s your full-time time job — it’s emotionally exhausting in a way I hope your actual job never is. No matter who you are, self-promotion is draining and rejection is inevitable. The truth of the matter is, applications can’t fill a forty hour week. Keep your expectations reasonable and give yourself adequate breaks to rest, spend time with people, and stretch your creativity. Your future employer will thank you for it. Unsure if now’s the time to start the job search? Take our career development quiz to learn how to accomplish your professional goals.